I am sending you the picture of the one room school at Sloantown in Scott county. 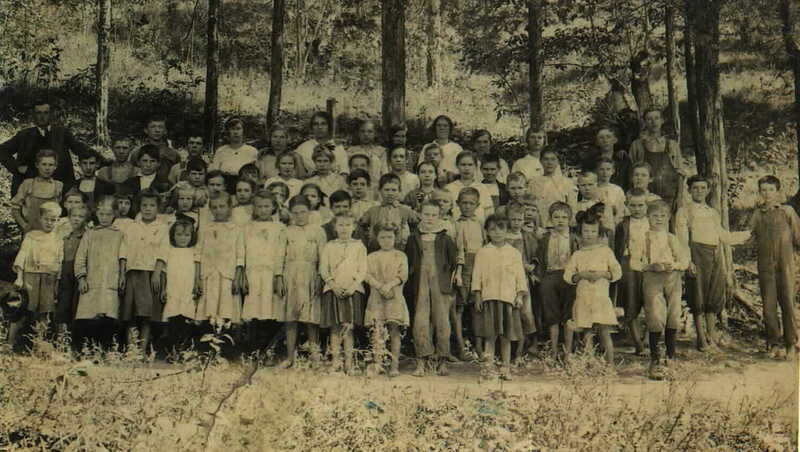 This is a great picture of many children who lived along the Clinch River that attended school at Sloantown. They had to cross the river in a boat to get to school. Amanda Williams Qualls sent me a copy of this picture. She is in the picture and is still living in Scott county. She gave me the names of the children in the pictures. I love the bare feet and the knickers. Second row, from left: Mabel Rhoton, Virginia Bryant, Clara Bryant, unknown, Vonnie Falin, Hazel Falin, unknown, unknown, Kedrick Sloan, Baxter Rhoton, Clarence Page, Mandy Falin, William Falin, Joe Benton, Bob Sloan, Pollard Williams, Clyde Qualls, Millard Qualls, Elmer Robinson, Roy Kindle. Third row, from left: Isaac Barnette, Everett Bryant, Llyod Ruth, Millard Rhoton, Clarence Rhoton, unknown, Virgie Sloan, Maggie Rhoton, Bertha Falin, unknown, Mitchell Williams, Lula Rhoton, Henry Williams, James “Jay” Rhoton, Ora Williams, Clarence Falin, Lola Sloan, Jay Williams. Fourth row, from left: Hicklen Clendenin (teacher), Carl Vanzant, Charlie Williams, Nannie Falin, Lillie Rhoton, Sara Tate, Rosa Williams, Emmer Falin, Ethel Falin, Maxie Sloan, Maggie Jane Williams, Hughie Vanzant and Edgar Rhoton. Genell submitted this photo given to her by Amanda Williams Qualls. I’ll do a bit of research and find out how I am related to lots of these people. Does anyone know about the woman named Osha Robinson. My grandmother is from Virginia and my name is Osha Robinson too. The little girl named Osha Robinson is my gAunt. She married but did not have children. She a sister to Lillie, Bobbie (my Grandmother) and Elmer Robinson, also pictured. In the 4th row going right to left, who is the “ghostly figure” between the 2 boys? This jumped out at me as I zoomed the picture to have a closer look at William and Emmer Falin and the other Falin children. I loved seeing this photo.. My Grandparents were from Sloan Town. Their names were Kermit Williams and Lilly Sloan. Forgot my email to share Sherrod Williams info. this picture is really cool. it has a lot of my family in it that i never got to meet. if anybody knows were a family tree for falin’s is i would really love to know about it. thanks for posting this pic. i could send to you. My grandmother was Carrie Falin, I would love to see any pictures you have of the Falin side of my family. “Amanda Williams Qualls” was my great grandmother. Her name is not actually Amanda, it’s Manda. But everyone knows her by Mandy. She was married to Millard Qualls. Della Williams is my mama Kermit Williams is my Uncle. I just stumbled upon this picture looking for Bryants. My mother’s aunts Virginia and Clara Bryant are in the 2nd row. How cool to find this picture. I have been trying for years to find their grandfather William Bryant and my mothers great grandfather. His daughter was Louisa Jane Bryant mother of James Bryant. She later married David Falin when James was about 7 I think , not sure on that one. I have not been able to find the real father of James Bryant. I made a trip to Sloantown in 1989 and talked with an oldtimer who knew James Bryant that was quite a trip. I would really love to go back again. But thanks for posting such a cool picture. Glad you happened upon this. It’s great to find treasures like this! Marilyn – I saw your note. My mother was Virginia Bryant, and Clara Bryant is my aunt. If you see this, email me: walkerjanem@yahoo.com. My Grandmother is Juanita,Daughter of Everett Bryant. Are you saying Everetts’ grandfather was William Bryant? I have James Madison? Bryant as Everetts father,which would be my grandmothers grandfather. 2 of Everetts sisters are also in this photograph,Virginia and Clara. This is the only picturer we now have of my grandmothers dad who passed away when she was 15. Any info or pictures are much appreciated. Everett’s great grandfather was William Bryant. Everett’s father was James Madison Bryant James Madison Bryant’s father is unknown, but likely a Bowen based on my DNA. James Madison Bryant’s mother was Louisa Jane Bryant, and James Madison Bryant kept his mothers last name, Bryant. Louisa’s Jane Bryant’s father was William Bryant. I have been unable to find anything about William Bryant except he may have been born in North Carolina. Roxie Pierson was my great Aunt. She married Ballard Ramey. So many of those names I remember hearing my father talk about. What a treasure this photo is. My GGrandmother is Maxie Sloan. She married William Watts. I believe her mother was Mary Alice Falin and father James Harvey Sloan. Does anyone have any more information on her? My father was adopted so I don’t have much information. Thanks! My husband’s grandmother is Maxie Sloan and she married his grandfather, William Henry Watts. yes I have info on maxie sloan. To his youngest and most handsome son Rockie Harold Watts ! Was your father the brother of James Watts ? 4th row Charlie Williams was the bother of Hobert Williams, Amanda(Mandy) Williams,Nannie Williams,Ora Williams,and I sure I may messed a few I’m still learning of them all . my granny. My dad was Sherman Wesley Williams . They had 7 sons together and 2 daughters. after Charlie past Mary Susie Williams had 1 more daughter her father was Mel Horton. If Maxine Sloan is your grandmother , who are your parents ? James is my uncle, who r u married to? So excited to see this picture of the school and the students. Two of my Aunts , an Uncle and a great Aunt are pictured. Soon after they moved to Big Stone Gap. My grandparents were Worley and Clara Sloan. Pap had a brother named Patton and another brother named Milum(?) he also had sisters named Addie , Allie (she married H.P. Miller) and another sister named Virgie . Anna pearl watts is my mother an Roger abell is my father. Anna Pearl Watts was my aunt, my mom was her sister Elva. Pretty sure u r the sister of Betty Ann (Abell) Potter…am I correct? Yes I remember your mom,an Frankie.what was maxie mother name? I know her father was James harvey sloan. maxie lee mother was Mary Alice falin her father was james Harvey sloan. Mary Alice falin s father was Hezekiah falin. not sure who her mother was. maxie lee sloan also had a daughter name Elba pierce married to Frankie pierce . sons name ace,Dallas,John an a couple others not sure of their names. I am looking for families in scott county related to Mary Alice falin an Hezekiah falin. I am 99% positive that the little girl that is fourth in the second row, is my grandmother, Carrie Mae Falin Fleming. She was born in Clinchport Virginia in 1906, and her father was Haborn Campbell Falin. Not sure if the person shown to be Maxine Sloan is correct I was told my mother (her daugther) that she only went to the second grade…but she does have kinda the same facial features as my Grandmother, so maybe her older sister??? I am searching for martha Rachel horton she was married to Hezekiah falin , she was born in Kentucky. I am also looking for Mary a.Stone also was once married to Hezekiah falin,in1853. She was born in 1834 she was from scott county Virginia. Yes betty potter is my sister and E.Pierce is my aunt. Nice photo. Glad it was shared. I know that Falins lived in that area. I’m doing some research on the Michael Falin/Elizabeth Head family of Scott county and Hancock county Tennessee. If anyone has knowledge of that family I’d really like to get in touch with them. I am writing to see if you found anything on my Pike family in Scott Co., Va. My ancestor George Pike married Jane(unknown maiden name). I believe James Pike who married Lucinda may have been a younger brother to George Pike. They all ended up in WV but most seem to have disappear after that. I cannot find where they were before Scott Co., Va. Any clues would be helpful, have been stuck for years.